The LeanIn movement, founded by Facebook COO Sheryl Sandberg, has garnered a tremendous amount of social media buzz since the early, pre-publication interviews; emotions and opinions ran strong from the onset. Countless blogs were written both for and against Sandberg’s philosophy as soon as the book hit the market. With the help of all of the earned online buzz, and mainstream media attention, the book became an immediate best seller. Sandberg captivated many women when she began her Lean In interviews. Community We want all women to have the confidence and know-how to achieve their goals. This starts with an active and supportive community. Each day we’ll encourage an open exchange of ideas and information. We will also share Lean In Stories—short narratives of moments in life when we choose to “lean in” or “lean back” intended to inspire, teach and connect us. Education We offer a growing library of free online lectures on topics including leadership and communication. Produced in partnership with the Clayman Institute for Gender Studies at Stanford University and other well-known experts, these lectures offer women practical skills they can apply in their daily lives. Circles Lean In Circles are small groups that meet monthly to encourage and support each other in an atmosphere of confidentiality and trust. We provide the materials and support to run a successful Circle, including online spaces that make it easy for members to stay up-to-date and connected. Circles are powered by Mightybell, the first network of private groups. The negative reactions to Lean In were immediate and harsh; Michelle Goldberg outlined some of the more absurd negative reviews in her post on Women in the World back in March of this year. The New Yorker published a compelling piece about the ‘piling on,’ and the blogosphere was alight with posts bashing Sandberg and her movement, including the blogs of many prominent marketers I follow, and most of them were women. It’s easy for Sandberg to talk about Leaning In when she has so much money she can hire extra help at home. Sandberg is dismissive of stay at home moms. LeanIn is for white collar moms only, and not relevant to the real struggles of working mom’s who are not making big bucks. Sheryl Sandberg grew up privileged and is out of touch with anyone who didn’t. Sandberg is blaming women for not trying hard enough when it is really the fault of generational sexism. Sandberg’s reaction to the initial criticisms was muted. In a compelling interview this past June, she answered many of the questions and criticisms. 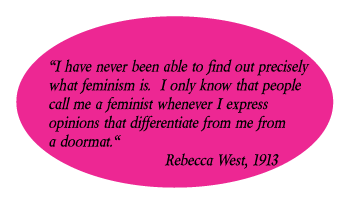 She states that she wasn’t surprised because the gender issues women deal with are deeply personal, and she understood that she was taking a huge PR risk by writing the book because of the passion the subject of feminism elicits. Sandberg acknowledges the stereotypes and barriers women face through no fault of their own. She poignantly uses one of her original points from the book to explain the backlash Lean In is facing: the fact that the more successful women become, the less liked they are, when the exact opposite is true of successful men. To the most harsh criticism, the idea that Sandberg is blaming women for not trying hard enough and therefore promoting a clearly ‘un-feminist’ line of thinking with Lean In, Sandberg talks about the internalization of stereotypes against women. She zeroes in on the ‘too aggressive’ label that is often put on women who go after it at work, and she talks about how women have to navigate the existing system on their way up, and then work to change it once they’re in a position of Leadership. 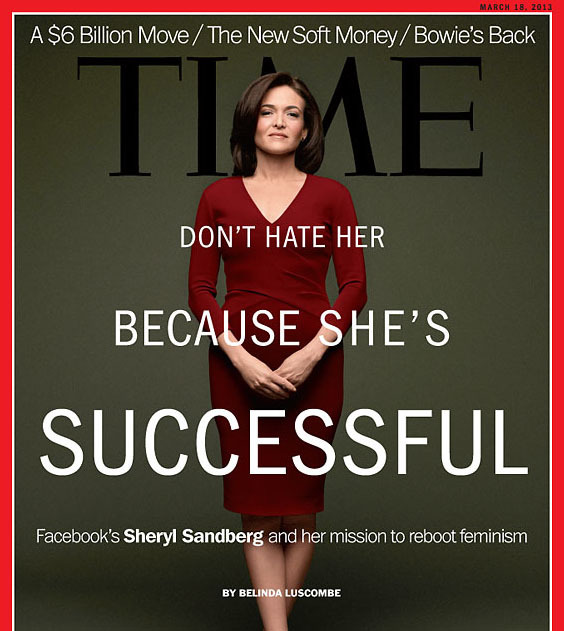 The interviewer directly asks Sandberg about her privilege and power insulating her from the realities that most women from different socio-economic backgrounds face; she answers that charge with stories about women from different circumstances taking her message of self-empowerment and using the ideas of self actualization to make changes in their workplaces. Near the end of the interview, Sandberg says that she’s grateful for the debate, because these discussions are the only way to change the status quo. Sandberg’s position as COO of Facebook leaves her open to additional criticisms for the many frustrations Facebook lays at the feet of its users. A couple of months ago in a post for this series, we were harshly critical of Sandberg’s obvious and disappointing silence on the very serious issue of Facebook’s tolerance of horrifically misogynistic pages and images. During the campaign against Facebook, we were not alone in our criticism; John Raines gathered over 225,000 signatures on his Change.org petition aimed squarely at Sandberg. Although Facebook did indeed change its attitude and no longer allows the hateful imagery that was the impetus for the campaign, Sandberg never spoke up about it. The post was met with an avalanche of disdain in comments that followed it; the irony of an organization based on women valuing themselves more asking for an intern to work for free was lost on no one. Many rightfully pointed out that the organization was effectively practicing economic discrimination, since those without financial support from family, or independent wealth, could not work for free. That follow up comment did nothing to calm the swirl of negative PR buzz; Sandberg’s critics smelled blood and new, critical blog posts rained down on the organization. I am Rachel Thomas, the president of LeanIn.Org. We recognize there is an ongoing public debate on the appropriate use of unpaid interns. So we want to share the facts with you and our community. Like many nonprofits, LeanIn.Org has attracted volunteers who are passionate about our mission. We’ve had four students ask to volunteer with us. They worked flexibly when they could, and often remotely. As a startup, we haven’t had a formal internship program. Moving forward we plan to, and it will be paid. We support equality – and that includes fair pay – and we’ll continue to push for change in our own organization and our broader community. Where Does the Lean In Discussion Go From Here? The discussion about Sandberg and her Lean In movement appears to have the legs to last a long, long time. The organization continues to build its circles and earn proponents, while the critics appear to have enough gas to continue railing against it. In the end, I think we should all be as ‘un-surprised’ as Sandberg; discussion about feminism and discrimination is always full of passion. Regarding the issue of Sandberg’s wealth invalidating her voice on career advice for women, one has to stop and ponder: when men write career self help books, is their own success or upbringing EVER a reason to NOT value their advice? Concerning stay at home moms, the book talks about Sandberg’s guilt when confronted with her choice not to stay at home; I know many, many women who can empathize with that. Why does a book about women advancing their careers have to be taken as a criticism of women who choose to stay home? When men write books on careers, does anyone call them out for not speaking directly about blue collar workers? As far as the ‘privileged’ critique, Sandberg’s father is an ophthalmologist, and her mother was a French teacher and then stay at home mom. Sure, she was not raised in poverty, but to disregard her philosophy because she wasn’t is a criticism I do not see aimed at men who write on business or self actualization. The charge that Sandberg is blaming women for their own circumstances is most definitely not held up in the book; she tells stories of the challenges she faced because of the system she was forced to work within. One of the recurring issues is how women are labeled as ‘bossy’ or ‘aggressive,’ and how she pushes back against that labeling. I know that this discussion won’t end here; and Lean In will continue to be the target of deserved and undeserved criticism. I just hope that more bloggers take the time to read the book before taking to their publications to voice their own opinions.